One-quarter of the way through the 2018 season, the Yankees’ bullpen has not yet been the strength everyone expected. The bullpen hasn’t been bad by any means. But it hasn’t been automatic either. David Robertson’s given up some big homers, the outs aren’t coming quite as easily for Chad Green, and Dellin Betances is still prone to meltdowns. It’s been touch and go at times. To make matters worse, both Tommy Kahnle and Adam Warren are on the disabled list, and gosh have the Yankees missed them. They’ve played a lot of close games lately — they’ve won a lot of close games lately, I should say — and the bullpen has been worked hard. Having Kahnle and/or Warren around to absorb some of the workload sure would’ve been nice this last week or two. In the meantime Aaron Boone has had to rely on some other guys to get big outs, including Jonathan Holder. Holder had a miserable start to the season, allowing seven runs in 2.2 innings before being sent to Triple-A Scranton. 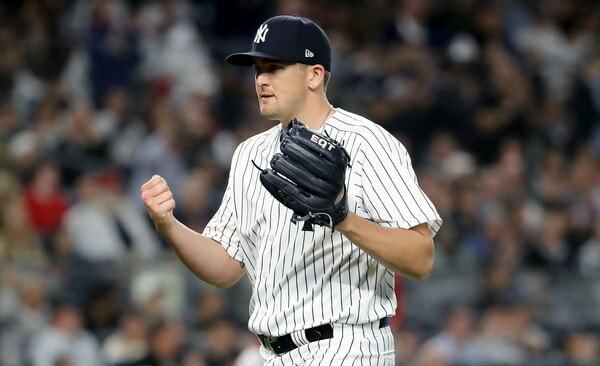 Since resurfacing — Holder was called up when Warren went on the disabled list — Holder has been damn nearly untouchable for the Yankees: 9.2 IP, 2 H, 1 R, 0 ER, 1 BB, 8 K. Most notably, he escaped a two on, one out jam in Wednesday’s win over the Red Sox. Holder’s fastball velocity is nothing special but his fastball spin rate is better than the league average (2,263 rpm). His curveball spin rate is among the best in baseball and comfortably better than the league average (2,501 rpm). Holder’s curveball spin rate is on par with guys like Justin Verlander (2,851 rpm) and Tyler Skaggs (2,741 rpm). The Yankees are spin rate believers and Holder is a spin rate darling. That’s why he keeps getting chances. 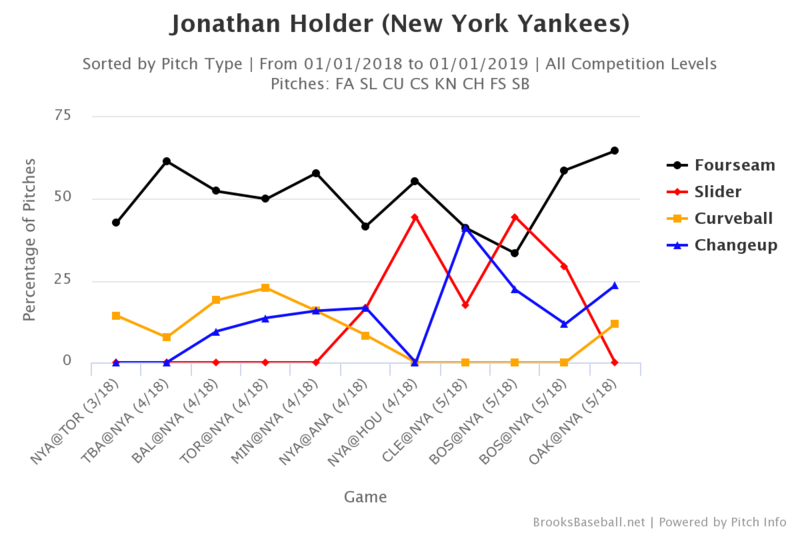 Interestingly enough though, since Holder rejoined the Yankees, he’s more or less shelved his trademark curveball, and instead gone with sliders and changeups as his primary secondary pitches. There’s been a few curveballs here and there. Mostly it’s been sliders and changeups. The Yankees had Holder work as a starter in the minors back in 2015 because he has a deep arsenal — they scrapped that plan because his stuff backed up so much when working out of the rotation — so it’s not like he pulled the slider and changeup out of nowhere. He’s always had them, but for years he was a fastball/curveball reliever because those are his two best pitches. Now he’s a fastball/curveball/changeup guy. Hmmm. Let’s be clear here, Holder has thrown only 9.2 innings since returning. They’ve been 9.2 great innings, but only 9.2 innings. He had a similarly excellent stretch around this time last year. This could be nothing more than small sample size noise. I do think it’s interesting Holder has changed his pitch selection though, particularly because he’s put his trademark pitch (high-spin curveball) in his pocket in favor of the slider and changeup. There is potentially a tangible explanation for Holder’s recent success. This isn’t the same Holder getting those outs. This is a Jonathan Holder with different pitch selection, and hey, once the league catches on, maybe he won’t be so effective anymore. For now though, I think Holder’s recent pitch selection and subsequent success is a #thingtowatch. The Kahnle and Warren injuries have created an opportunity for him, and the pitch selection changes could lead to him having staying power really for the first time in his big league career.